A woman in Berkeley is selling two unique looms. considering their unique nature and history. Please pass on to anyone you know who might be interested. The Ahrens Looms website gets more exciting for me everyday. We have the full support of Bob Kruger of AVL and Weavolution is announcing it in their newsletter. We’ve added more features that would be expected on websites. There is a Forum section with several topics and the latest added is the FAQ page. Here is a sample of how a FAQ (frequently asked question) works. When you click on the question the answer pops up below. Try it! Why are there only 4 treadles? Because that’s all you need for 4 shafts. 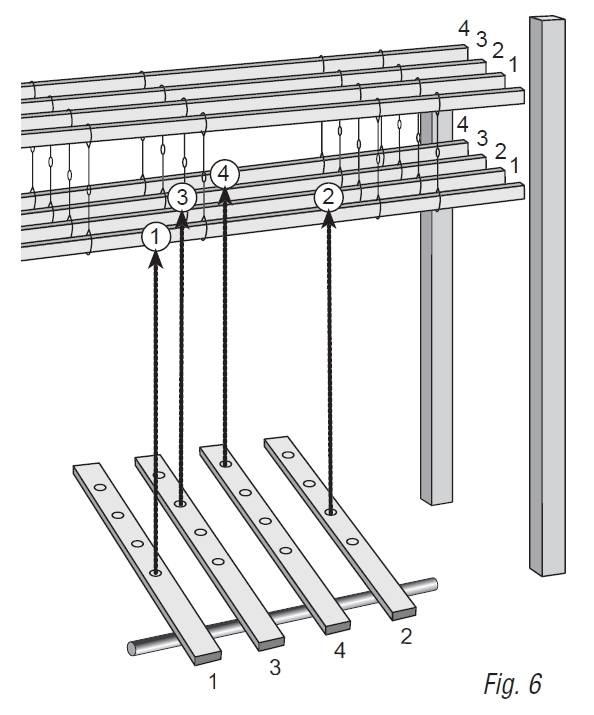 With those 4 treadles and your two feet you can treadle all of the possible combinations of shafts. There are 14 combinations possible.You never need to tie up any combinations and that way you can easily change tie-ups anytime you want. If you use Jim’s unique tie-ups for the 4 treadles, it’s easy to walk your feet for all the weaves you have available. Just Published!! My new website about Ahrens Looms! My good friend Vera Totos and I have been working for months on creating a new website about Ahrens looms. Jim Ahrens built looms for efficient weaving, using his own engineering and centuries old European techniques. This site explains their use and operation. Check it out and let me know what you think using the “Contact” page or as a “comment” at the bottom of each page.